If you are a family with 2 small children or a couple looking for ample sleeping and storage space then a good 4 Person Tent is a must-have necessity for camping. Yet finding a decent 4 Person Tent which ticks all boxes for your money is often easier said than done. There are hundreds of options available, with features, disadvantages, and statistics that can be mind-boggling for even the most analytical of minds. Luckily, we have done the work for you. 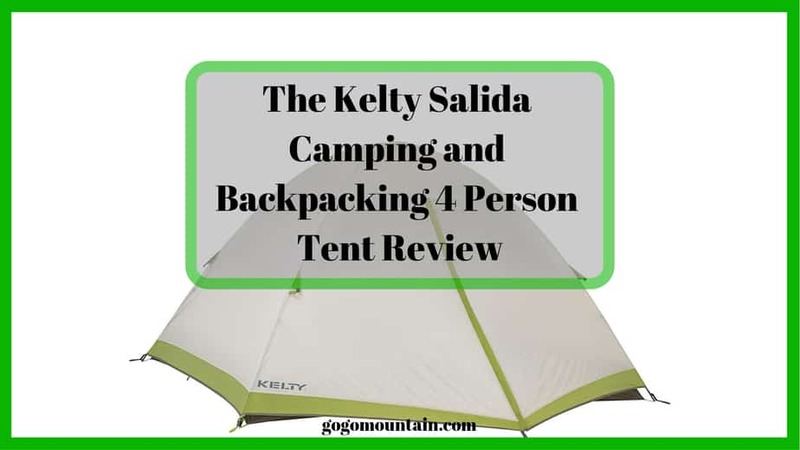 Our goal is make your purchasing decision easier and significantly less overwhelming with our candid review of the Kelty Salida Camping and Backpacking 4 Person Tent, which is just one of many excellent options. Choosing the proper back-country shelter is vital, and is one of the most important gear decisions you will make. You want to make sure you have a tent that offers good seasonality, is light weight, and is the perfect capacity for your intended number of sleepers. If you are looking for a lightweight, high quality, and low-cost tent, look no further. 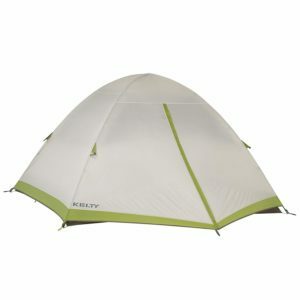 The Kelty Salida Camping and Backpacking 4 Person Tent is a great option for first-time backpackers, car campers or if you are a family with a couple of small children. After reading through the many Amazon reviews, customers seem to love how roomy this tent is, offering 55 square feet of interior space which includes 11 feet of storage space in a vestibule. The tent is roomy, offering plenty of comfort for a few campers at a time. Because the tent is a self-standing design and made out of lightweight materials, it’s easy to assemble and to move. 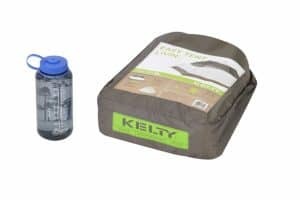 If you need to pack up and move campsites, or just move the tent a few feet away, it’s easy to do this with the Kelty Salida. The tent poles snap together quickly with buckles, and you don’t have to thread the poles through snagging tunnels or tie endless pieces before you can lay down to sleep. It stands up well against strong winds and rains, offering minimal leaks along the seams. While the tent is comfortable in cool, dry weather, spring rainstorms can make camping in this tent more of a challenge as condensation can build up inside. The other minor complaint regarding this tent was in its lack of a secondary door. As with many smaller tents, this tent only offers access on one side of the tent. This can make it more challenging to accommodate two or more people inside the tent. 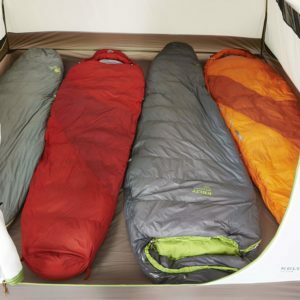 While this tent is marketed as being able to hold four adults, it’s recommended that only two adults sleep in it at a time, or two adults and two children should be fine. This is because the tent is not terribly wide inside, and unless you are particularly cozy with all of the people with which you are camping, it might be a bit uncomfortable. This tent reaches a 56 in peak, and has a Floor area of 55 ft² / 5.11 m² which includes a Vestibule area of 11 ft² / 1.02 m². While the tent only stretches about 88 inches in length its plenty of space for a tall camper to lie down – it does not offer much additional space in the way of storage. The Salida is easy to assemble, offering user-friendly clips that allow you to set up the tent in just a few minutes of work. The aluminum poles are lightweight and come together easily, with snap-style clips that make assembly a cinch. All clip and fly attachments are color-coded, making them easy to identify and put together in cloudy or dim conditions. 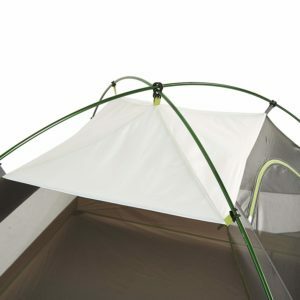 The tent is durable, offering a mesh upper and solid lower fabric. The 68D Polyester tent material is less susceptible to tears than other types of tent materials, and while it doesn’t offer maximum breathability, it holds up well after multiple years of use. Many users report zero tears, snags, pulling, or pills even after having the tent and using it for many seasons in a row. Just make sure you store it only when it has dried completely, as this will help prevent the accumulation of mold and mildew (common in all tents, and not just this one, of course). As a backpacking tent, the Salida is really beyond comparison, offering light packing weight (Packaged weight: 7 lb 5 oz) and versatility. Although it doesn’t compress as much as similar options, it folds down into about 13 x 15 inches. It weighs only seven pounds and five pounds, making it a good option for carrying on longer treks back into the woods. Even better, the tent comes with backpacker-friendly compact folding poles to make setup and teardown easy and seamless. This tent comes with an over-sized bag to make setup and take down easy. You don’t have to waste precious time attempting to stuff a large tent into an undersized stuff sack. This bag gives you plenty of room to stash extra materials, like extra stakes, ground cloths, or tarps. Another bonus feature of this tent is its corner mesh pockets that can be used to hold small items, like flashlights, cell phones, or car keys. It also has a mesh shelf at the top, allowing you to get some of your more fragile belongings off the ground. This tent also has a built-in no-see-um mesh. On clear nights when you don’t feel the need to use the rainfly, you can leave it off and stare up at the sky to enjoy stargazing without having to worry about being eaten alive by mosquitoes. On a rainier night, just toss on the rain fly and lull yourself to sleep with the sound of pulsating raindrops on the durable tent fabric. 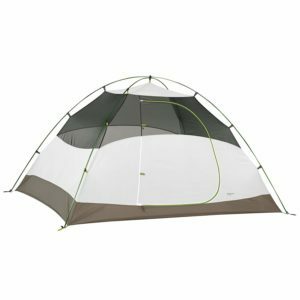 This tent is sturdy and durable, holding up well considering its price and size. With fabric and mesh tent walls and easy-to-use assembly clips, the tent is great for a beginning camper or someone looking for a casual weekend tent camping experience. Coming in at less than two hundred dollars, this tent is a fantastic option for the casual camper or backpacker. Overall, this tent is ideal for fair to medium weather conditions and is easy to put together, making it a good choice for campers or backpackers seeking a quick camping solution.